Patrick Macnee, who just died, embodied the ultimate gentleman adventurer for millions of people. 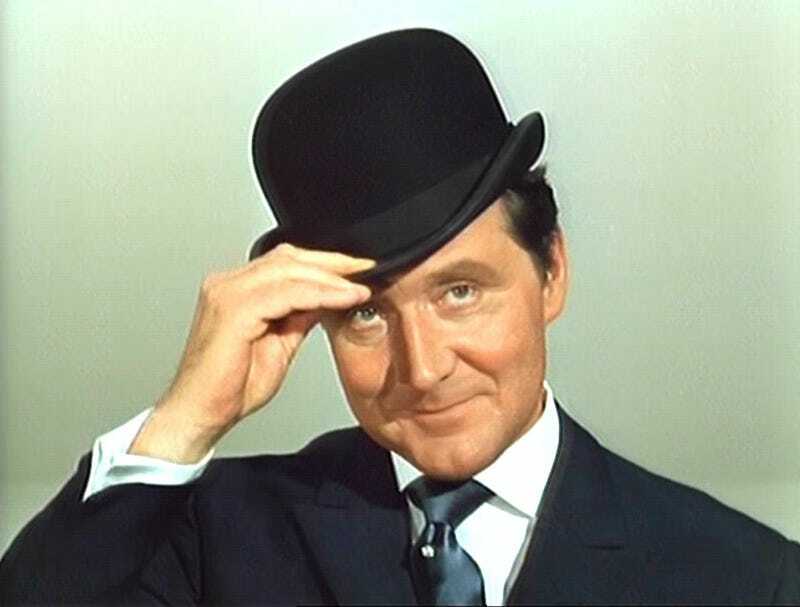 As John Steed in The Avengers, he proved that an old-school gent could be ready for anything—whether it be robot killing machines, or a tough, self-assured lady in a catsuit. When people remember The Avengers now, they’re probably more likely to think of Dame Diana Rigg, who rocked the aforementioned catsuit as Emma Peel. But the bond between John Steed and Emma Peel is the axis the show revolves around, and Steed is a crucial ingredient in the show’s marvelous success. Macnee, as Steed, is dashing and jovial, and never seems threatened by the sensuous super-fighter next to him. If anything, the obvious pleasure that Steed always takes in the antics of Peel, or any of the other women he’s paired with over the long run of The Avengers, is a key factor in making the show so charming, to this day. The relish with which he announces, “Mrs. Peel, we’re needed,” has made that the most quotable line from the show. He generally treats Emma Peel, and his other female partners, more or less as equals. In fact, the fact that Emma Peel is frequently mentioned as a “feminist icon” is partly a tribute to Patrick Macnee’s ability to embody a version of the traditional English gentleman—one who’s comfortable having a powerful woman at his side. And in every single interview you read with Macnee himself, he always credits Rigg entirely for the show’s success, and praises her acting—comparing her in one instance to Dame Maggie Smith. In one interview, Steed says that when Linda Thorson replaced Rigg, the show went downhill because they no longer had the same dynamic of Steed and Peel being equals. In general, John Steed always seemed as though he was ready for anything. Armies of “Cybernauts” (deadly robot soldiers)? Why not. Shrinking rays? Sure. Deadly telepathic mind probes? But of course. The science fiction ideas in The Avengers were frequently far out, but—in a format later copied by Jon Pertwee’s Doctor Who—they were always located in present-day England, and connected to the familiar elements of the modern world. When you watch The Avengers now, it seems campy and good-natured, but with a huge subversive streak. It’s dripping with love of the old England, with its quaint villages and jolly-gruff aristos, but also helps to chip away at that mystique since everyone always turns out to be secretly in league with mad scientists. And The Avengers is quintessentially of its time—it’s tied to the 1960s Carnaby Street fashions, as well as the Beatles-era social revolutions. You only have to look at the disastrous 1998 movie version to see how much The Avengers depends on a 1960s sensibility. It started ordinary, it started really rather bad. As I said, there was a review that said, really, we think the commercials are better than the show. And then it gradually developed. We got some wonderful minds working on it. One is now dead, David Green, who won seven Emmy awards for Roots and other things. We had some of the best people in anything, and television was just starting. A lot of people don’t realize those things. If you’re in at the beginning of things, if you’re the first man on the moon, you’re the first man on the moon, and no one can take it away from you. And we were the first people in television to do a show as different as that. If I was Sean Connery, I would have been macho. I always remember Honor Blackman going to the Bond film [Goldfinger] saying, ‘Oh, he wouldn’t let me get away with that.’ Implying, [that I] always did [when she was on The Avengers]. I’d grown up with a lot of women. My mother was a famous lesbian in the 20s and 30s and I grew up with only women, so I was used to getting on with them. In addition to The Avengers, Macnee had a fantastic career in movies and TV series, appearing in everything from Battlestar Galactica to James Bond films to the Night Man TV series. He tends to turn up in the oddest places, like the direct-to-video films The Creature Wasn’t Nice and The Lobster Man From Mars. But he always brings the same sparkle and good humor that made John Steed such an indelible part of pop culture. It’s impossible to measure Patrick Macnee’s impact on everything we love today. He helped change Batman and Doctor Who, and he helped influence scores of superheroes and superspies with his dashing style and nonchalance. At a time of rapid social and scientific change, he presented a figure who was absolutely ready for whatever new thing he might come across, and yet recognizably British. Most of all, he was a version of James Bond who treated his female best friend as an equal. He’ll be missed.